With this elegant stand, anyone can easily create an adorable centerpiece bouquet that doubles as dessert. Made of sturdy iron, powder coated with a shiny black finish, the dome-shaped rack can be set in a flower pot, atop a decorative platter, on a cake plate, or even in a carved-out pumpkin. 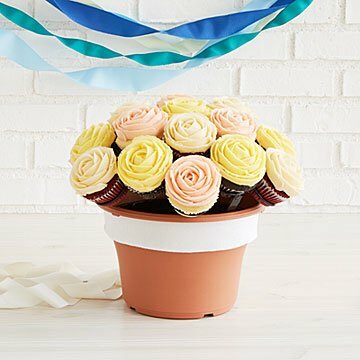 Fill it with homemade (or store-bought) cupcakes decorated as flowers, seasonal favorites like elves or witches, or anything the guest of honor loves. Holds 19 standard-sized cupcakes or muffins. Since nobody ever makes 19 cupcakes, that leaves some extra happiness for the cook. Made in China. NOTE: Pot is not included.